Poetry declamation is an integral part of many cultures. In Vietnam, a modernized version of this ancient art form still enjoys a small but devoted following. This page presents audio clips of selected modern and classical poems. All these audio clips are encoded in RealAudio 28.8 format. Please select a title to download (or play) the corresponding audio file. You can get the proper players and encoders by visiting the RealAudio Web site. The audio clips can also be downloaded from here. 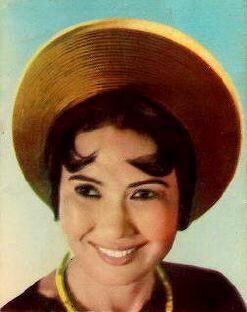 A portrait of Há»“ Ä�iá»‡p (Madame Butterfly), perhaps the foremost practitioner of the art of poetry declamation in pre-1975 South Vietnam. 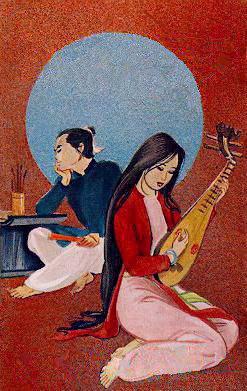 One of the many musical scenes from The Tale of Kiá»�u, a masterpiece of Classical Vietnamese Literature. Van Hoc Viet Nam : the original texts of many poems on this page and additional audio clips can be found on this site. This CD features new interpretations of some modern Vietnamese poems by Báº¡ch Háº¡c, an artist of the younger generation. It is available from UNICOM, Inc., P.O. Box 141169, Minneapolis, MN 55454-USA. Vuon Tho Tuoi Xanh : Poems by young Vietnamese netters from Japan and elsewhere. Recent Works by young poets from Vietnam. Nhac Tho Truyen : A collection of Vietnamese poems in GIF format. Aus Deutschland. Translations of selected Classical Chinese poems, by a poet of the younger generation. Classical Chinese Poetry : A selection of Classical Chinese poems. French Poetry on Webnet : Un serveur de poÃ©sie française avec du son RealAudio. The English Poetry Server : Texts of many Western (mainly English) Classical poems. From Carnegie Mellon University.